In many process boiler systems, zeolite softening of water is not sufficient to meet feed water quality standards. In these cases (typically high pressure boilers >1000 psig), the water is demineralized. This process removes most of the mineral content of the raw water. Demineralizers depend upon both cationic and anionic exchange processes. They can be arranged in many different combinations, based upon incoming water contaminants and desired final water quality. By the end of this chapter you should have a basic understanding of what demineralization does, how these systems work, and the basic steps necessary to troubleshoot a system. A discussion of what takes place as the raw water is processed through the various units in a demineralizer may help to explain the resins and their function. As mentioned previously, the strong acid cation unit contains a zeolite resin that is regenerated with sulfuric acid (HCI can also be used, but it is more expensive than H2SO4). As the untreated water passes through the strong acid cation unit, the hydrogen ions that occupy the exchange sites in the resin are replaced by Ca, Mg, Fe, etc., ions. The companion ions of the cations removed-CO3, SO4, Cl, N03, PO4, etc.-pass through the resin and link up with the rejected hydrogen to form the strong acids H2CO3, H2SO4, HCI, HNO3, H3PO4, etc. Obviously, the effluent from a strong acid cation unit is very acidic-, it often has a 2.0-3.0 pH. For this reason, the cation vessel and the interconnecting piping and valves are lined with rubber. As one might expect, sodium, the least preferred cation, is also the most weakly bound. As a strong acid cation unit approaches the limit of its capacity, the ions shown in the list above begin to leak through in reverse order, i.e., sodium will leak first, followed in order by potassium, magnesium and calcium. In fact, a strong acid cation resin's affinity for sodium is so low that some sodium will always leak through, even when the resin is freshly regenerated. In actual operation, if a cation unit is to be run to near its "break" point for economic reasons, a parameter known as free mineral acidity is monitored to determine when exhaustion is approaching. Free mineral acidity, or FMA, is present when the water pH is less than 4.3 (the methyl purple or methyl orange end point in the total alkalinity test). By definition, FMA = the sum of the sulfuric, nitrate, phosphoric and hydrochloric acid in the water sample. The FMA of the effluent from a strong acid cation unit, therefore, is proportional to the level of the total exchangeable cations in the raw water. A boiler system can function properly or cease operation as a result of the quality of demineralized water that is used for makeup. Even the best internal treatment programs have their limits. This is why a thorough understanding of the owner's demineralizer system is so important to the water treatment consultant. With excellent feed water, even a mediocre water treatment program can be made to work in a high pressure system. Conversely, even the best chemicals and the most carefully thought-out treatment program can fail miserably when the demineralizer system cannot be counted on to deliver a quality feed water. Regeneration of a weak acid cation resin with sulfuric acid must be carefully monitored to insure that the acid concentration during the regeneration does not exceed 0.7%. Higher concentrations of sulfuric acid can react with the Ca++ in the exchange sites of the exhausted resin and result in the precipitation of calcium sulfate (CaSO4). Calcium sulfate, or gypsum, is insoluble even in the concentrated form of many acids. Often, mechanical removal is the only satisfactory way to rid the resin of this contaminant. From an operational standpoint, it is objectionable because it produces a pressure drop across the unit. Strong base anion resins are quoted as having two capacities: salt-splitting capacity and total capacity. The so-called salt-splitting capacity of a strong base anion resin is a measure of its ability to remove silica and carbon dioxide. The total capacity is a combination of the salt-splitting capacity and the resin's capacity to remove SO4-, Cl-, NO3- etc. Most larger demineralizer systems have been automated to some degree. Automatic step times and sequencing switches move the units through their regeneration steps. Some operators require that manual actuation of each step in the regeneration procedure be made. This precludes the possibility that a malfunction in the step control automation might send spent regenerant to the treated header instead of the waste system. Initial installation costs for a demineralizer system are quite high. During normal operation (discounting operator labor costs), resin replacement and regenerants account for most of the system's expense. Resins are very expensive, with the anion resins being the most costly. Replacing an anion resin charge (strong base resin) in a vessel containing 300 ft3 of resin can run as high as $40,000 for the resin alone. A rule-of-thumb estimate of 3% per year is generally used to estimate normal resin loss due to bead breakage, backwash losses, etc. In most cases, 66° Be sulfuric acid and 50% rayon grade caustic are used for regeneration. Sulfuric acid sells for about $ 50 per ton and rayon grade caustic sells for about $120 per ton (1986 dollars). The amount of acid and caustic used per regeneration varies as a function of the desired exchange capacity and the volume of resin to be regenerated. Typical regeneration levels for cation units are 5-8 pounds of 66° Be sulfuric acid per cubic foot of resin. Regeneration levels for strong base anion resins are 4-6 pounds of caustic per cubic foot of resin. When discussing a demineralizer train, the manufacturers generally size the units of the train so that the service cycle, based on an average makeup water analysis, will be about 24 hours. In some cases, a duplicate train is supplied to allow a rotational sequence to be set up (i.e., one train in service and the other being prepared for return to service). In other cases, a demineralized water holding tank is used to store water for use during service cycles. Depending on the size of the demineralizer train, a complete regeneration could take several hours to complete, from the initiation of backwash to rinsing the unit down, to specifications prior to standby. As discussed previously, during the normal service cycle on a strong acid cation unit, the effluent water from the unit contains free mineral acidity (FMA) in proportion to the cations in the raw water. The effluent pH is normally in the 2.0-3.0 range. As the resin moves toward exhaustion, the effluent pH begins to increase (FMA begins to decrease). The "breakthrough" of sodium will occur first, because it is the least preferred cation. The sodium break will precede the breakthrough of the cations associated with hardness (Ca++, Mg++). From the boiler operator's standpoint, this is very fortunate, because the sodium compounds that leak through (Na2SO4 NaCl, etc.) are highly soluble and are not a major contributor to scale formation. The breakthrough of sodium is objectionable from the standpoint of its impact on the control of the high pressure boiler water treatment program (it produces high pH in the boiler water). As mentioned earlier, most demineralizer systems are anion-limited as far as service cycle length is concerned. In other words, the anion unit is likely to break on silica long before the cation unit breaks on sodium or hardness. Because of this, many operators pay little attention to cation FMA or pH unless serious operational problems develop. Most of their time is spent worrying about the silica leakage from the anion. The service run on the strong acid cation is terminated when the anion unit reaches the end of its run. Both units are taken off line together and prepared for regeneration. The cation unit is always regenerated first, because a source of cation free water is required for backwashing the anion unit. If a water source containing any magnesium is used for backwashing an anion, the Mg++ can react with unused OH- in the anion and the precipitation of Mg(OH)2 will occur. Equallv troublesome is the potential for the precipitation of MgSiO3, a very sticky, tenacious deposit. Backwashing of the strong acid cation is initiated by reversing the flow of raw water and directing it to the outlet from the unit. A block valve downstream of the backwash line is first closed to prevent raw water from entering the anion unit. Backwashing fluffs up the cation resin bed and aids in releasing any debris that has collected in the bed during the service cycle. Ideally, backwashing should expand the resin bed by 50%. Backwash flow rates are generally held at 5-6 gpm/ft2 of vessel cross-sectional area. Backwashing is normally continued for 5-10 minutes, or until the backwash water becomes clear. Once backwashing is completed, diluted sulfuric acid is pumped into the cation vessel through the regenerant distributor. Initially, an acid concentration of 2% or less is started into the unit. This precludes the possibility of precipitating CaSO4 in the resin bed. After a prescribed period of time, the acid concentration is increased to 6% for the balance of the regeneration. Acid flow rates during regeneration are normally 0.5-1.0 gpm/ft3 of resin. 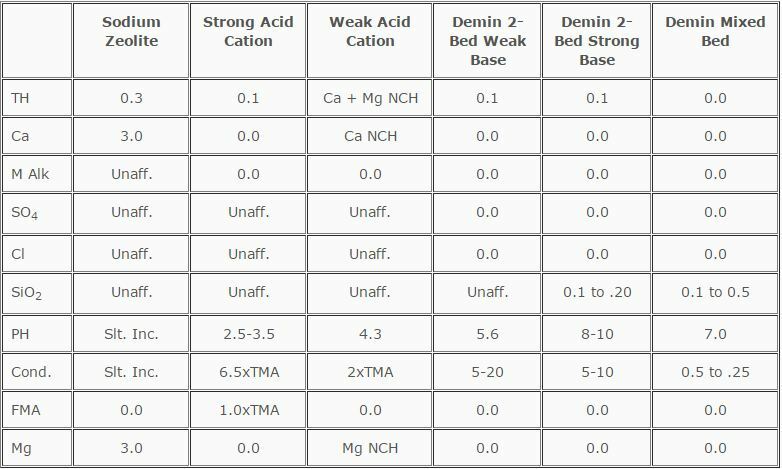 Acid requirements for regeneration of strong acid cation resins are generally in the 5-8 lb/ft3 range. The determination of the expected capacity of any strong acid cation resin is a fairly complex procedure. Because each resin type exchanges the various cations found in raw water at different rates, depending upon the cation and its affinity, a careful evaluation of the raw water chemistry must be made and the manufacturer's reference data consulted to arrive at a capacity figure. Resin exchange capacity is also a function of regeneration level. A complete dissertation on the subject of establishing a particular resin's capacity to demineralize a particular water is beyond the scope of this book. Strong Acid Cation. The slow rinse of a strong acid cation unit is an extension of the regeneration acid injection step, with the acid feed stopped and only dilution water going to the unit. Slow rinsing insures that all of the acid is evenly distributed through the resin and all of the exchanged cations are purged from the resin bed. Slow rinsing is conducted at a flow rate of 0.5-1.0 gpm/ft3 of resin for not less than 15 minutes. As in the acid injection step, the effluent from the cation unit during slow rinse is directed to the sewer. Strong Acid Cation. Once the slow rinse step is completed, the rinse water flow rate is increased to 1.5-3.0 gpM/ft3 of resin for 30-60 minutes. Fast rinsing completely resettles the resin and insures that all spent regenerant and exchanged cations are swept from the vessel to the sewer. Fast rinsing is generally continued until the FMA exiting the unit is 10-20% of that experienced during the last service cycle. Strong Acid Cation. Once the strong acid cation is rinsed down to the desired effluent water characteristics, it is isolated from the system on standby or placed back in service as required. The regenerated cation unit may be used to supply backwash water for its companion anion unit. Strong Base Anion. Service flow rate through strong base anion resins typically runs at 2-14 gpm/ft2 of resin bed cross-sectional area. The conductivity and silica level in the treated water are the parameters normally used to monitor the performance of these units. Many industrial demineralizer systems are supplied with automatic silica analyzers and on-line conductivity analyzers with alarms and adjustable setpoints. Strong base anion resins are generally taken out of service for regeneration when the silica level in the treated water exceeds 0.1 ppm and/or the conductivity exceeds 10 micromhos. Most strong base anion units are designed to provide specification water for a period of about 24 hours. Resin degradation due to organic fouling and resin loss due to attrition are the two main reasons why anion train service cycles tend to decrease with time. Most resin manufacturers quote a useful life of about 3 years for a load of strong base resin. It is not unusual to see a strong base resin lose up to 30% of its salt-splitting capacity in the first of year operation. Other factors (inlet water characteristics, channelling, improper regeneration, etc.) can affect the service run length of any strong base resin. All of these factors must be taken into consideration when the production capacity of a strong base anion unit falls below its specified capacity. As discussed under the section on strong acid cation unit operation, the actual ion exchange capacity of a strong base anion resin depends on a number of factors. Some of these include regeneration level (lb/ft3 of resin), caustic quality, regeneration temperature, the type and quantity of exchangeable anions, etc. Again, a complete description of the process by which strong base anion resin capacity is determined is beyond the scope of this book. Strong Base Anion. There is one phenomenon that occurs at the end-of-run on a strong base anion unit that helps the operator determine the proper time to get the unit off-line for regeneration. This phenomenon is associated with the conductivity of the effluent water and is used to catch a unit before it breaks on silica. Just prior to silica breakthrough, the conductivity of the effluent water from the anion units takes a noticeable drop: a short time later, it increases sharply, indicating breakthrough. This decrease in conductivity is clearly evident on a plot of the readings taken from the conductivity probe in the bottom of the anion vessel. During the normal service cycle, sodium that leaks from the cation unit combines with OH- from the anion unit to produce NaOH, which is conductive. As silica first starts to break through, the silica combines with the sodium leakage from the cation to produce sodium silicate, which is less conductive than the NaOH it replaces. Therefore, a dip in the effluent conductivity occurs. Once the anion unit is taken out of service, it is made ready for the regeneration procedures. First, the block valves are manipulated to isolate the unit from the treated water system. Water from the companion cation unit is directed up from the bottom of the unit at rate of 2-3 gpm/ft2 of vessel surface area. Backwashing is continued for 5-10 minutes with the effluent going to the sewer. A bed expansion of 50% is desired. Strong Base Anion. The strong base anion unit is regenerated with a 4% solution of rayon grade caustic and cation free water. Caustic (50%) is pumped from the storage area and mixed with dilution water of the required quality. The 4% caustic solution passes through a heater (steam or electric) and on to the regenerant distribution system in the anion vessel. The effluent from the caustic heater is controlled at 120° F (48.89° C). The elution of the exchanged silica from the strong base resin is greatly enhanced by the hot caustic. If the available time and heater capacity exist, it is advisable to preheat the anion bed to the desired caustic temperature before caustic injection is started. This insures that the resin bed operates at 120° F (48.89° C) during the full regeneration cycle. If hot caustic is not used for the regeneration of the strong base resin, silica removal can be incomplete. This leads to reduced capacity on the next service cycle. Silica remaining in the resin can also polymerize and permanently foul the resin. Commonly, regeneration levels of 4-6 lbs/ft3 of resin are used for anion units. The warm caustic is introduced to the unit at a rate of 0.25-1.0 gpm/ft3 of resin volume for 30-80 minutes. Strong Base Anion. Once the full charge of caustic has been injected, the caustic pump is turned off and a slow rinse with dilution water only is started at the same flow rate as that used for caustic injection. Slow rinsing is conducted for a minimum of 1 5 minutes. Slow rinsing moves the regenerant solution through the resin in "plug" flow fashion and helps remove some of the exchanged anions. Strong Base Anion. 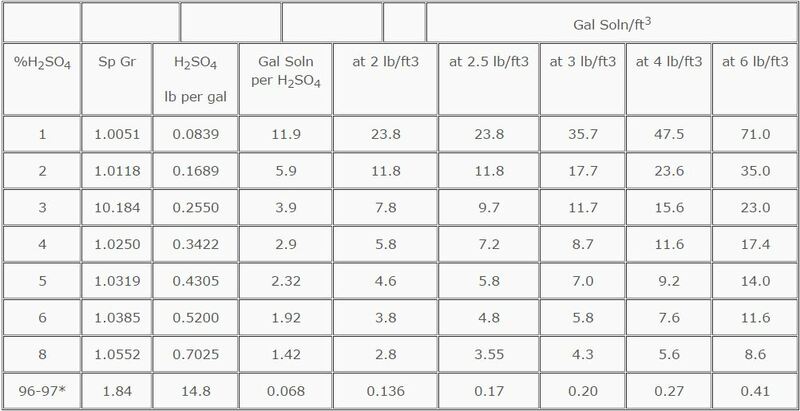 Once the slow rinse cycle is completed, the rinse rate is increased to 1.0-2.0 gpm/ft3 of resin for 1-2 hours to scour all of the regenerant and exchanged anions from the resin. The end of the fast rinse step is generally determined to be the point at which the effluent conductivity reaches 10 micromhos. If the anion unit is placed on standby for a significant period of time, it should receive a short fast rinse prior to being put back in service. This insures that any silica or other anions that have eluted from the resin back into the stored water are swept to the sewer and not the treated water storage system. The regeneration procedures enumerated above apply generally to other anion resin types. The one notable exception is the so-called stratobed anion unit, which has a combination of weak and strong base resins. With this type of unit, regeneration precedes backwashing to insure that the resins don't mix during backwashing. A. Problem: High Sodium Leakage (low FMA). Check service flow rate... poor flow distribution may result from high or low flow rates. Has the unit been returned to service from standby? A short rinse before service can help. Is the regeneration level satisfactory for the raw water characteristics? Refer to resin data; increase acid by 30% at next regeneration. Is unit regenerated or backwashed at least once every 24 hours? Extended service runs can result in channelling of flow. Was the unit run to complete exhaustion during the last service cycle? It should receive a double regeneration before the next service cycle to achieve maximum capacity. Is a valve leaking? Leaking block valves can introduce a small amount of raw water into the treated water. Are the acid concentrations satisfactory? High acid concentrations during initial phases of regeneration can result in CaSO4 precipitation in the resin bed. Low acid concentrations result in incomplete removal of sodium ions from the bottom of the resin bed and sodium leaking during the following service. Are the regeneration flow rates and times satisfactory? Check the manufacturer s recommendations. Excessive backwash flow rates may result in resin loss while low backwash flow rates may lead to channelling during subsequent steps. Low flow rates during acid injection may result in CaSO4 precipitation. High acid flow rates lead to poor regeneration due to insufficient contact time. Is the rinse of adequate flow and duration? If the previous rinse was inadequate, the high FMA (higher than during previous service cycle) is due to the incomplete removal of spent acid from the resin after the regeneration. Additional rinsing will bring it down. Does the effluent contain hardness? Adjust sample pH to 4.3-10.0 with 1N NaOH prior to running hardness. If calcium is present, the precipitation of CaSO4 should be suspected. Check acid concentrations during regeneration and flow rates used. Are the acid regenerant valves leaking acid into the unit during the run? If the FMA from the unit in service increases only when a parallel unit is being regenerated, there is a good chance that a valve is not holding the pressure of the acid line and acid is entering the operating unit. Has the raw water cation loading increased? Check the raw water total cation loading against the manufacturer's design loading. To determine the total raw water cation loading, add the sodium content to the total hardness. A good estimate can be made in the field by adding the M alkalinity of the raw water to the FMA at the cation effluent. Is the service flow rate satisfactory? Poor flow distribution may result from either high or low flow rates. Channelling will cause only a small area of the resin bed to receive a large portion of the raw water. Is the unit regenerated or backwashed at least every 24 hours? Extended service runs can lead to channelling of the flow. Was the unit overrun during the previous service cycle? A unit run to exnaustion must be regenerated twice before full capacity will be restored. Are the acid concentrations satisfactory? Insufficient acid feed to the unit during regeneration will lead to lower than expected capacity. Check the actual acid fed against the manufacturer's recommendations. Are the regeneration flow rates and times satisfactory? Excessive flow rates during regeneration will reduce the acid/resin contact time required for good regeneration and reduced capacity will result. When all of the troubleshooting tips are checked out and the problem is not resolved, a physical examination of the vessel interior will often reveal a mechanical problem. Check the raw water inlet distributor for missing spray heads, the regenerant distributor for damaged or missing parts, the surface of the resin for unevenness or signs of resin degradation, etc. What is the cation sodium leakage? High cation sodium leakage is indicated by a low FMA at the cation outlet. Each ppm of sodium leakage from the cation adds about 10 micromhos of conductivity to the effluent of the strong base anion unit. The effluent pH from the strong base anion will also be high (over 8.0). If high sodium leakage is the problem, refer to the troubleshooting tips for the strong acid cation unit for a resolution. Was the anion unit rinsed sufficiently at the end of the last regeneration? Good anion rinse usually requires 100-150 gallons of rinse water per cubic foot of resin in the unit. Check rinse flow rates and times to confirm. Is a block valve leaking? Check water samples upstream and downstream of any suspect valve. Was Mg(OH)2 or CaCO3 precipitated on the resin during the last regeneration? Cation treated water should be used for backwashing the anion resin and in the preparation of caustic regenerant solutions. The use of raw water for either will result in precipitation of Mg(OH)2 and CaCO3 in the resin bed. Elution of these compounds during the service cycle can produce high effluent conductivities. Is the service flow rate satisfactory? High or low service flow rates may produce channelling. Is the regeneration level satisfactory for the raw water characteristics? Refer to the resin manufacturer's strong base anion resin leakage curves. 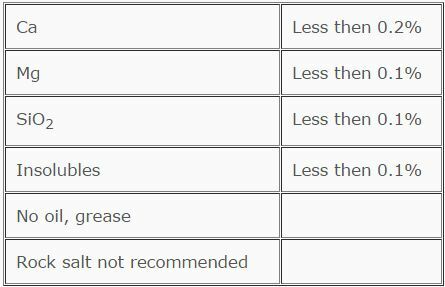 Increase the caustic used for regeneration by 30% to see if the silica leakage decreases during the following service cycle. Is the unit regenerated or backwashed at least every 24 hours? Extended service runs can result in channelling of the flow. Was the unit overrun during the last service cycle? If the unit ran to exhaustion during the last run (the unit broke on conductivity as opposed to silica), a double regeneration will be required to restore full operating capacity. Are the regeneration flow rates and times satisfactory? Variations from the recommended procedures will lead to unsatisfactory operation. Has the raw water changed with respect to the design water analysis? Have a thorough analysis made of the raw water and check the total exchangeable anion content against that used for the unit design. Determine whether the cation or anion is exhausting first. If the cation unit exhausts first, the conductivity and pH of the anion effluent water will increase. If the anion unit is exhausting first, the conductivity of the anion effluent water will rise and the pH will drop. If all operating variables check out, an inspection of the strong base anion unit internals is recommended. The anion resin should be analyzed periodically to determine if it has become fouled or degraded. Total and salt-splitting capacities should be determined. Water analyses express the levels of the various ions in solution both as the ion (as in analysis by atomic absorption) and as an equivalent amount of calcium carbonate (CaCO3). The convention chosen by resin manufacturers for expressing exchange capacity of the various ion exchange resins is kilograins/cubic foot. The kilograms are assumed to be the calcium carbonate equivalent. Therefore, before any calculations can be made to determine, for instance, the operating capacity of an ion exchange unit, all analyses must first be converted to the CaCO3 equivalent. Technical Grade 66° Be acid, free of suspended matter and light in color, should be used. The sulphuric acid should mix completely with water without the formation of any precipitate. Acid with inhibitors should not be used. Note: Acid should be free of turbidity and contain no inhibitors. Do not use hydrochloric acid obtained as a by-product of chlorinated organic chemicals. Hydrochloric acid obtained by the salt acid or hydrogen chloride process is satisfactory.